This trail starts out crossing a creek in old growth forest with beautiful displays of bunchberry in July. Eventually it crosses the creek again and opens up to reveal dramatic cliffs surrounding a wet meadow. The trail then switchbacks up the side until it reaches an old lookout site on a small promontory with great views of nearby Coffin and Bachelor mountains and distant Mt. Hood to the north (see photo above) and much of the rest of the Cascades to the east and south. On the way up, a small north-facing section of cliff and talus slope is home to special plants like the early-blooming Douglasia laevigata and late-blooming Gentiana calycosa. Be sure to stop along Park Creek if you have time on your way home. 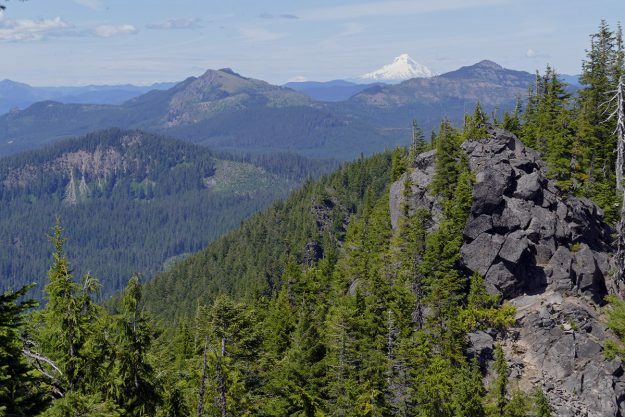 Take Hwy 22 north for 4.6 miles from Santiam Junction. Turn left (west) onto Lava Lake Meadow Road 2067. There will be a sign for “Old Cascades trails”. If you are coming from Detroit, drive south on Hwy 22 past milepost 76. Turn right onto Rd 2067. After 2 miles cross a bridge and turn right onto road 560. Continue for 2.9 miles and cross the intersection of Rd 572. Follow the “Pyramids Trail” sign straight till it dead ends 0.6 mile at the trailhead parking area.